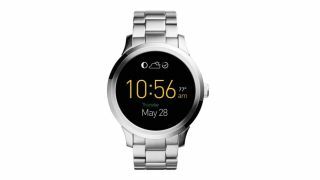 We've known about Fossil's plan to enter the connected wearable space for a while now, with the company treating us to a tantalising glimpse of the smartwatch back in August. Today, the watchmaker has revealed some more information about their connected devices, although detailed specifications are still light on the ground. There's something for everyone with a whole family of devices, ranging from US$125 (around £80, AU$175) up to $275 (around £180, AU$380). The range starts off with the Q Reveler and Q Dreamer (pictured below, left and right). These are more basic, step counting fitness trackers. They keep track of how far you walk and vibrate with smartphone notifications. The Dreamer seems more dedicated to socialising, while the Reveler, "dares you to be bold and explore more around you," whatever that means. Both will be available on October 25 and cost $125 (around £80, AU$175). Next in the line-up is the Q Grant (above, centre), which seems like a Withings Activité-style fitness tracker, hiding fitness-tracking smarts with an analogue watch face. Going above and beyond the Activité, the Q Grant also features smartphone notifications, with a vibration motor and customisable LED indicators on either side of the watch. The analogue tracker will also be available on October 25, but will cost between US$175 (around £115, AU$240) and US$195 (around £125, AU$170). Finally, the family is headed by the Q Founder, an Android Wear-powered smartwatch. We're still waiting to hear the final specs for the Q Founder, but we do know it'll come packing a chip developed by Intel and Google. As it runs Android Wear, expect functionality to be identical to other Android Wear devices. The Q Founder will be available, "just in time for the holiday shopping season", with prices starting at $275 (around £180, AU$380). All of the devices will be compatible with Fossil's proprietary app which features more detailed activity/ fitness tracking, customisable notification settings, and, most interestingly, a feature called, "Q Curiosity", which alerts you when it's time to break free from your everyday routine. "Our customers are obsessed with their personal sense of style and staying connected, and we are thrilled to enter into this emerging category with an answer to their needs," said Jill Elliott-Sones, chief creative officer at Fossil. "Fossil Q is the result of countless hours of meticulous design expressed through a playful curious lens. Our hope is the unique attention to detail in both our connected accessories line and app cue our audience to try new things, be more curious and experience the world around them like never before."